Over the past few weeks, I've been watching a television programme called "Active Shooter- America Under Fire." The programme is about mass shootings in America and how they happened, why the happened and how the police responded to them. I missed the very first episode of the series but have watched the three since. Programme two was about the San Bernardino, California shooting where a Muslim couple went into a office where the husband worked and shot 36 people, killing 14 of them. The couple were later killed by police in a shootout after a car chase. Programme three was about the Charleston, South Carolina shooting where a white supremacist went into a church and shot and killed nine African American people and wounded a tenth. Dylan Roof, the shooter, was arrested a day later and sentenced to death for hate crimes and also to life imprisonment for the nine counts of murder due to his guilty plea. The latest programme, which I watched this morning, was about the the shooting at the Washington Naval Yard in 2013. A lone African American man went into one of the buildings with a shot gun and shot and killed 12 people and wounded three others including a police officer. It is also reported that he took a pistol from one of the security officers he had killed and began using that when he ran out of ammo for the shot gun. He was eventually killed by police officers in a shoot out. 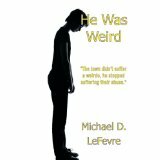 While I was watching the latest episode, I was wondering about how such a programme would be made for the shooting that occurs in my book, "He Was Weird." In the story, the shooter, Mark Leversee, my main character, goes into school one day with an Uzi and a nine millimeter pistol and opens fire on his classmates in the school playground. After causing many casualties, (you'll have to read the book for exact numbers), and all possible targets either down or cowering in their classrooms and hearing the sound of police sirens, Mark carries out the final objective of his plan going out on his own terms. Because of the above, there would have been no car chases or no shoot outs. The reader does get to experience the account of the first police officer to arrive on the scene and his inner battle at the prospect of an armed confrontation with a thirteen year old boy, but that confrontation never happens. Therefore, the police officer arriving at the scene and finding the shooter already down, may not make for exciting television. Of course, after the shooting as in the story, there would be much lamentation of how and why such a tragedy happened. How a boy of thirteen could get a hold of such high power weapons and what made him do it. The bullying hell Mark went through would have been mentioned and loosely linked to why he did it. Although many would be quick to try to downplay it. More would be made of his Asperger's Syndrome and DAMP conditions, much more so than before he took up arms and did the deed. Then of course, there would be the ones who used the shooting to cash in, they would have definitely hogged the limelight in any TV programme. On the other hand, the planning and method in which Mark carried out his shooting might have been more interesting. During their investigation, law enforcement officials all agreed that he had received some marksmanship and military training, even if the latter was inadvertently. Probably why I say that the true innocent victim of it all was Mark's mother's boyfriend, Ted Ziminsky, who taught Mark how to shoot. Also, a recreation of the carnage that followed as a result might have been an interesting view too. It would have to be a recreation because I never say that there are any cameras around the school to show the event. Even if it had, some of those who read "He Was Weird," stated that the shooting would be too brutal to show live, especially if the camera should happen to catch Mark when he double taps some of his victims. All in all, as much as I find it amusing that my shooting in "He Was Weird," could appear on "Active Shooter- America Under Fire," I'm glad that it's just fiction and never will. Still, I'm not convinced that it would have made for good ratings anyway. However, the best way to find out for yourself is to read the book.